Discussion in 'Picture Frame Design' started by shayla, Mar 27, 2019. This is a sign on quarter-inch thick glass, being reframed in stained glass moulding. DarthFramer and Larry Peterson like this. 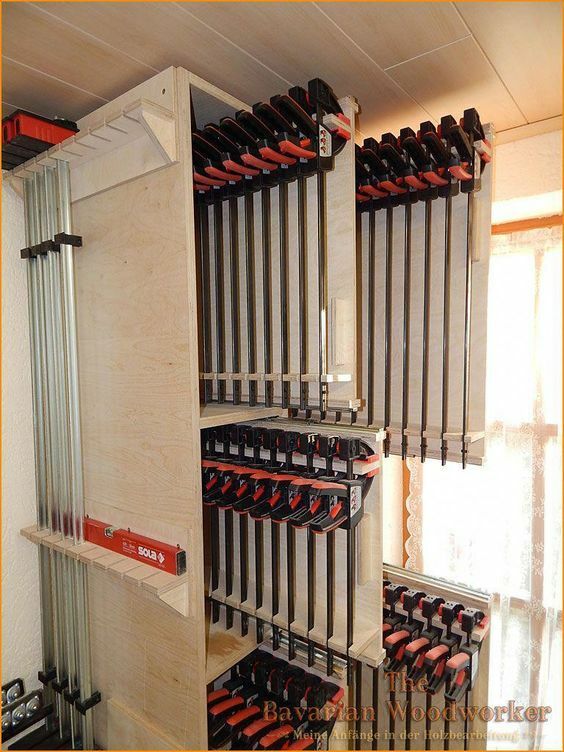 You can never have too many clamps. I actually did one similar to the first picture where I steam bent some cherry for a bar I built. Rick Granick, shayla and cvm like this. MATTHEW HALE and shayla like this. Well that's O.K. then. I was picturing something totally different. I'm glad you kept the discussion family friendly. Speaking of the mighty framer, where is Dirk? He hasn't posted anything since January 26. Do you have him locked in a cage in the basement building frames? We need proof of life. Post a picture of him holding today's newspaper or the Cookie Monster is going to pay you a visit. What? Seeing his hands isn't enough? I even showed half of the zipper on his hickory shirt. meant he said he wants to go shopping, and he denied it. artfolio and Larry Peterson like this. OK, you dodged a bullet.............cookie. Now, we're sad. We could have had a cookie, and we don't. This photo is from our first try at the job. Later, a tiny framing tragedy happened, so we got a new one. So, here's a question. When you join U-channel moulding, do you use nails or screws? The folks who started me in framing used glue and screws, filling in over screw heads. That way, if the glass ever broke, the frame could be easily disassembled. This morning, I asked another framer, who said he drills, then pin nails with a nail slightly larger than the hole. What do you do? And while we're here, what do you use for hanging from the top? I know what we do, but how about you? I glue and v-nail the sides and bottom rail, but just put screws in from the top, colored to match. It's easy to open and the top is normally not visible. I use the screw eyes that I posted in the other thread if the frame isn't too big. Heavier items like stained glass usually work with a (decorative) chain to the top corners. Do you know where to get those chain holders that are inset into the wood, where the chain just looks like it's coming out of the frame? We had a smaller, two-sided frame in last year that had one, and it looked sweet*. 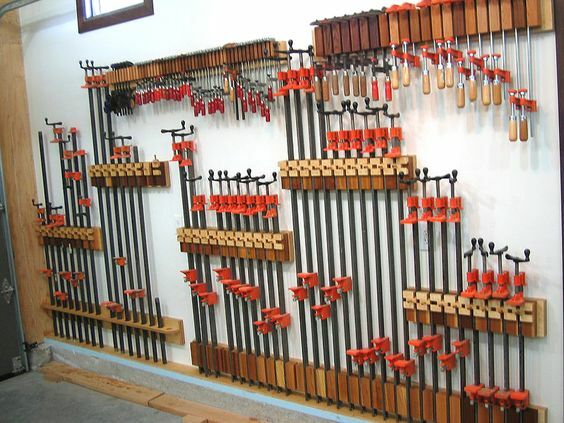 Possibly Rockler. Or maybe Lion from the UK (carried by TechMark here in the US). We use a couple different types from Delphi Stained Glass Supplies. We nail the bottom corners and drill and screw the top corners. 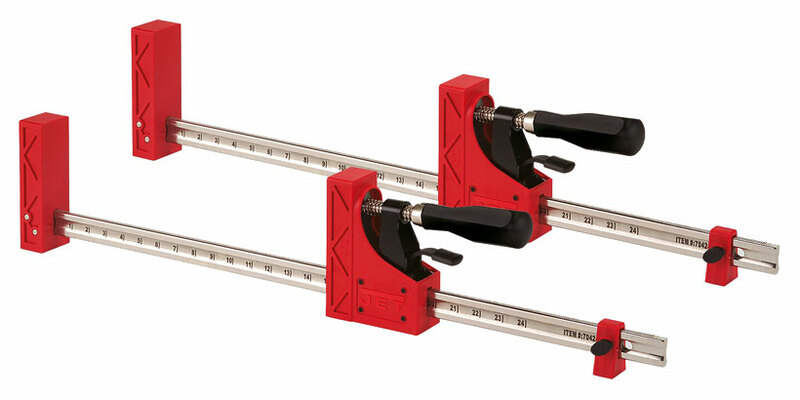 And back to clamps ... what is your preferred choice in parallel clamps? It's high time, around here, to ditch the pipe clamps and join the twenty-first century. Not everything needs to join the 21st century. Pipe clamps are fine in my book. I have pipe clamps and I also have some of the ones pictured below and bunches of smaller clamps in just about every variety. 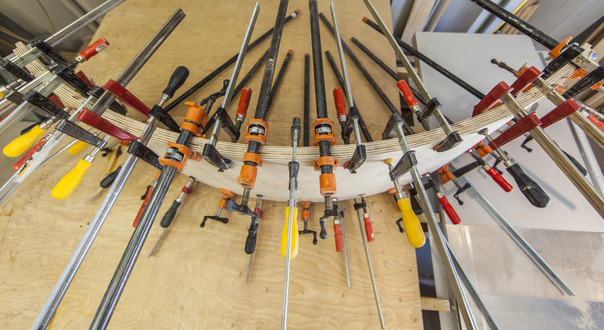 One advantage to pipe clamps: They can be as long as you have pipe. Handy when you re-frame that old master that is 16 by 20 feet. They look interesting. If I was still doing a bunch of wood working, I would probably find an excuse to buy some. Are those the Jet parallel clamps? When I tried even light pressure on the pipe clamps when assembling the stained glass moulding, the clamp faces did not remain parallel and imparted an angular force on the moulding, causing the face of the miter to deviate from flat. Just wanted to prevent shifting when drilling pilot holes. Do you guys use one screw/nail in each corner, or two? And are they parallel, or perpendicular, to one another? Last night while perusing my Google news feed on my tablet, this link came up, probably because I did an image search earlier on clamps. And here you had me thinking that Sheldon Cooper had given up physics to take up phraming. 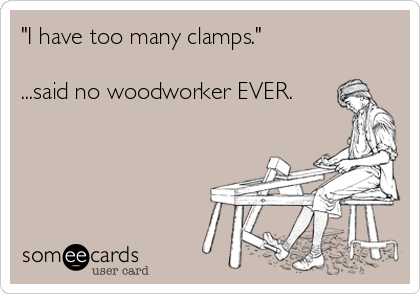 My favorite part about when he clamps frames is calling him Jed.